The results of your search for Romantics - Other Romantic Literature can be seen below. Please contact us if you require more information. (Edited with a Preface by L.S. (Lancelot Sharp). Monody on the Death of Chatterton by S.T. Coleridge). Cambridge. By B. Flower for the Editor. 1794. pp. xxix, (iii), 329. Engraved tite, 1 plate. 8vo. Half calf, cloth boards, spine relaid. Top edge gilt. Wise p197. London. W. Goldsmith. 1772. pp. (ii), iv, 26. 4to. Last leaf repaired, affecting the text minimally, all words are readable. Some foxing, title page a little grubby. 1st edition, with the Goldsmith rather than the Newberry imprint, of the first of Chatterton's Rowley forgeries to be printed. ESTC T33753. BOUND WITH:- MICKLE, William Julius. SIR MARTYN, A Poem in the manner of Spenser. London. Flexney. 1777. pp. 6, (ii) of glossary, 71, (i). 4to. Vingette on title page, slightly browned. 1st published in 1767 as 'The Concubine'. ESTC T27760; BOUND WITH (BARBAULD, Anna Letitia). POEMS. London. Joseph Johnson. 1773. pp. vi, 138. 4to. p.2 misnumbered 4. Resetting of the 1st edition, H3 cancelled leaf. ESTC T74944. Half red morocco, marbled boards, head and tail of spine slightly rubbed. London. Charles Tilt. 1832. 2 vols. 78 plates of which 5 are lacking, namely Solway Firth from Allonby, Tolbooth, Coldingham, Warwick from Kenilworth, & Solwy Sands. Royal 8vo. Half calf, marbled boards. Some foxing. Vol 1 Waverley to Legend of Montrose; Vol 2 Ivanhoe to Woodstock. With the bookplate of B C A Prior and previous owners name on front free enapper. Sold as a collection of plates. Paris. L. Dureuil. 1829. 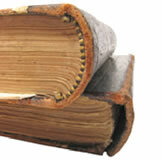 2 vols bound together with continious pagination. pp. (iii), 467. 12mo in 6's. Quarter calf, marbled boards, slightly rubbed. Front hinge cracked but sound. Some foxing. Includes Mme de Stael, Schiller, Walter Scott, Voltaire, Rousseau, Racine, Lamartine, Victor Hugo, Goethe, Alexandre Dumas and Byron. The authors pseudonym is an anagram of his name. Edinburgh. By James Ballantyne and Co. for Archibald Constable and Co. 1816. 3 vols. pp. viii, 336; 348; 372. 12mo. Half red morocco with marbled boards. Marbled paper torn away on back board of Vol 1. Lacking half titles. Some minor foxing. 1st edition. With the bookplate of Edward Harenc. A good set. London. J. Limbird. 1824. pp.81 - 96. 8vo. Disbound. With an illustration of Mary of Buttermere's House and relevant article. Cambridge University Press. 1995. pp. xiv, 259. Frontis, 9 illustrations. 8vo. D/W, slightly torn. Edge of text block beginning to brown.. Cambridge Studies in Romanticism. General Editors Marilyn Butler & James Chandler. ISBN 9780521473361. A very good copy. London. MacMillan Press. 1993. pp. viii, 303. 8vo. D/W. Inscribed on front free endpaper. ISBN 0333439155. A very good copy. London. F.C. & J. Rivington. 1817. 2 vols. pp. viii, 436; 386. 8vo. Original boards, spines and labels. Spines slightly cracked, corners bumped. In Vol 2 on pp365/366 there is a small hole affecting text. Some slight foxing. 1st edition. Halkett & Laing. BL.William Beloe (1756 - 1817) Divine & Miscellaneous writer was born in Norwich. In 1803 he became Keeper of Printed Books at the British Museum. He was dismissed from this post in 1806 because of extensive thefts by a man named Dighton who had insinuated himself into Beloe’s good graces. Contributors are David M. Baulch, Ute Berns, Michael Bradshaw, Frederick Burwick, Alan Halsey, Raphael Hormann, Diane Long Joeveler, Andrew James Johnston, Nat leach, Jerome J. McGann, Christopher Moylan, Michael O'Neill, Marjean D. Purinton, & Shelley Rees. Aldershot. Ashagte Publishing Ltd 2007. pp. xviii, 273. 8vo. D/W. The Nineteenth Century General Editors Vincent Newey & Joanne Shattock. London. The Falcon Press. 1952. pp. xvi, 215. 8vo. D/W. Label removed from bottom corner of ffep. The book covers the end of the C18th and the beginning of the C19th. A time during which women emerged from the ornamental and domestic position with a demand for equaility which was not attained for a further 100 years. The object of the book is to show how by their life and character a chain of women made possible this advance. London. Victor Gollancz Ltd; New York. Payson & Clarke Ltd. 1928. pp. 8 illuminated leaves, (ii). 4to. Black cloth with gilt decoration. Facsimile edition reproduced from the copy in the British Museum. No. 229 of a limited edition of 850 copies in England and 850 copies in the United States. With a Note by John Middleton Murry. London & Toronto. J.M. Dent & Sons Ltd; New York. E.P. Dutton & Co. Inc. 1932. pp. (vi), 11 illuminated leaves, 9 - 25. 4to. D/W. Ulverston. For the Author by J. Soulby. 1818. pp. viii, 142, (ii). 8vo. Original printed boards, top inch of spine lacking. With a list of subscribers. Johnson 134. Norwich. Fletcher & Alexander. 1854. pp. xii, 409, (viii) & 24 of adverts. Frontis. 8vo. Original blind stamped cloth, head of spine slightly frayed. London & Sydney. Croom Helm. 1985. pp. 250. 8vo. D/W. Tunbridge Wells. Parapress Ltd. 2000. pp. xiv, 130. 16 illustrations. 8vo. D/W. ISBN 9781898594680. A very good copy. Translated from the original Manuscript by R.C. Dallas, Esq. London. Baylis. 1798. pp. 255, (iii). Frontis, 1 plate, 1 facsimile. 8vo in 4's. C20th cloth. Lacking half title. Title off-set. Variant with Booksellers spelt correctly on title page and no list of subscribers. Cambridge University Press. 1995. pp. xviii, 291. 26 illustrations. 8vo. D/W. Previous owners name neatly inscribed on front free endpaper.Cambridge Studies in Romanticism. General Editors Marilyn Butler & James Chandler. ISBN 9780521454612. A very good copy. Translated into English Verse by A.S. Cottle. Bristol. Joseph Cottle. 1797. pp. xlii, (iv), 318, errata leaf. 8vo. Full calf, later spine, which does not match the tree calf of the boards but is perfectly presentable. Includes in verse an Epistle to A.S. Cottle by Robert Southey. With the bookplates of Simon Nowell-Smith and of Judith Adams Nowell-Smith. London. Eveleigh Nash. 1908. pp. vi, 519. Frontis, 1 plate. 8vo. Pictorial cloth, front board slightly marked. Front & rear end papers foxed. Inside front board slightly scarred. Paris. Ladvocat Librarire. 1829. pp. 188. 8vo. Half calf, marbled boards. 8vo. Some slight foxing. In the introduction Delavigne denies that he has copied Byron's tragedy. 'On a dit que mon ouvrage etait une traduction de la tragedie de Lord Byron. Ce reproche est injuste. J'ai du me rencontrer avec lui dans quelques scenes donnees par l'histoire; mais la marche de l'action, les ressorts qui la conduisent et la soutiennent, le developpement des caracteres et des passions qui la modifient et l'animent, tout est different.' In Stendhals Scarlet & Black, the hero, Julien Sorel compares the nobles of France that he meets at a ball to the nobles of Venice he has seen portrayed in Delavigne's Marino Faliero. London. J. Johnson. 1809; 1812. 6 vols. pp. viii, 417; (ii), 390; (ii), 388; (i), vii, 460; (ii), 392; (ii), 452. 12mo. Modern contemporary style half calf, marbled boards. The first three volumes are the second edition, the last three volumes are the third edition. The titles of the works are on the spine labels rather than volume numbers. Vol 1 is Ennui, pp 197/198 & pp 201/202 are torn and repaired not affecting the text; Vol 2 is Almeria, Madame de Fleury, and The Dun, pp. 349/350 is torn and repaired not affecting the text; Vol 3 is Manoeuvring;, Vol 4 is Vivian; Vol 5 is Emilie de Coulanges and the Beginning of The Absentee; Vol 6 is the conclusion of The Absentee. All endpapers are foxed and there is further foxing in the third edition volumes. All volumes lacking half titles. Sadlier 786. Uppsala. A-B Lundequistska Bokhandeln. 1959. pp. 240. Frontis. 8vo. Printed wrapper. Text in English. Contributors are Moira Ferguson, Caroline Franklin, Michael Franklin, Tim Fulford, Lauren Henry, Malcolm Kelsall, Peter J. Kitson, Nigel Leask, Joseph W. Lew, D.L. Macdonald, James C. McKusick, Timothy Morton, Alan Richardson, & John Whale. Cambridge University Press. 1998. pp. xi, 287. 8vo. D/W. Very occasional pencil markings in the margins in Caroline Franklin's essay. ISBN 9780521591430. A very good copy. University of Nebraska Press. 1979. pp. xvi, 158. 8vo. D/W. London. The Society for Theatre Research. 2003. pp. xiv, 220. Frontis, 39 illustrations. 8vo. Laminated boards. geneve. Librairie E. Droz. 1959. pp. 123. 8vo. Printed wrapper. Unopened. Cambridge University Press. 2007. pp. viii, 297, (v). 8vo. D/W. Cambridge Studies in Romanticism. General Editors Marilyn Butler & James Chandler. ISBN 9780521866385. A very good copy. Contributors are Ronald Blythe, Helen Boden, Valentina Bold, Mary Cannell,Paul Chirico, R.J. Ellia, John Goodridge, Rodney Lines, john Lucas, Clare MacDonald, Leonora Nattrass, Judith Rowbotham, & Barbara Taylor. The John Clare Society & The Margaret Grainger Memorial Trust. 1994. pp. 240. Frontis, 11 illustrations. 8vo. Paperback. ISBN 0952254123. A very good, clean copy. Oxford & New York. Woodstock Books. 1995. pp. (xiv), 11, 184, (iv), 220. Small 8vo. D/W. Revolution and Romanticism 1789 - 1834. A series of facsimile reprints chosen and introduced by Jonathan Wordsworth. Poole & New York. Woodstock Books. 1995. pp. (xiii), (viii), 172. Small 8vo. D/W. Revolution and Romanticism 1789 - 1834. A series of facsimile reprints chosen and introduced by Jonathan Wordsworth. Abyssinian Fount and Egyptian Plain: A Junian Interpretation of Symbolism in The Prelude by Betty Tucker Mann; Time is, Time was, Time's Past. Byron's Struggle with Time by Koichi Yakushigawa; Some Sonnets of Shelley by D.P. Sen Gupta; Manuscript Revision in Byron's Childe Harold's Pilgrimage Canto IV, Stanzas 128 - 145 by James Hogg; Lady Hester Stanhope's Autograph Letter to Michael Bruce: An unpublished account of her life in Lebanon by James Hogg. Salzburg. Institut fur Anglistik und Amerikanistik Universitat Salzburg. 1978. pp. 129. 8vo. Paperback. Salzburg Studies in English Literature under the Direction of Professor Erwin A. Sturzl. Romantic Reassessment. Editor: Dr. James Hogg. No. 81. Contributors include Northrop Frye & Martin K. Nurmi, George L. Barnett, Stuart M. Tave, Elisabeth W. Schneider, James T. Hillhouse & Alexander Welsh, Kenneth Curry, Hoover H. Jordan, R.H. Super, John E. Jordan, & Carlisle Moore. New York. For The Modern Language Association of America by New York University Press. 1968. pp. xviii, 395. 8vo. D/W, slightly frayed. Revised Edition, 2nd printing. Includes chapters on William Blake, Charles Lamb, William Hazlitt, Sir Walter Scott, Robert Southey, Thomas Campbell, Thomas Moore, Walter Savage Landor, Leigh Hunt, Thomas De Quincey & Thomas Carlyle. Indianapolis. The Bobbs-Merrill Co. 1944. pp. (xiii), 364. Frontis, 18 plates. 8vo. Red cloth, head of spine slightly frayed. 2nd edition. University of London. The Athlone Press. 1978. pp. (vii), 199. 8vo. D/W. Aldershot. Scolar Press. 1995. pp. xiv, 274. 8vo. D/W. The Nineteenth Century General Editors Vincent Newey & Joanne Shattock. Cambridge University Press. 1998. pp. xii, 278, (iii). Frontis, 1 illustration. 8vo. D/W. Cambridge Studies in Romanticism. General Editors Marilyn Butler & James Chandler. ISBN 9780521572590. A very good copy. Hanover & London. For the University of Vermont by University Press of New England. 1984. pp. xi, 371. 3 illustrations. 8vo. D/W, frayed. ISBN 087451293x. A good, clean copy. London. Henry Colburn. 1826. 2 vols. pp. xvi, 349, (ii) of adverts; xii, 367, 4 of adverts. Vol 1 - Frontis, 1 double of music. Large 12mo. Half calf, marbled boards. Corners bumped. Title of Vol 1 slightly offset and one spine label chipped. Second edition. A nice copy. Lowe, Arnott & Robinson 3175. Single sheet, folded, 7.5" x 9". 4 sides densely written. The letter describes a journey from Bowood House in Wiltshire to Inveraray Castle in Argyll. It is an amusing, entertaining and rambling thank you letter to Henry Petty-Fitzmaurice, later 3rd Marquess of Lansdowne. Lewis's journey takes him through Kidderminster ' this most infernal of all places.' He finds that 'the roads are all sand; the Hills are all brick-dust colour; the Houses are all dirty; the children are all ugly; the Men are all stupid; ... all the women are born old.' He fantasizes that the ground should open up and swallow Kidderminster and what it would be like when 'discovered in the reign of George the Tenth, like a second Herculaneum!' Discussing his route which takes him through the Lake District, reminds him to recount a report given to Lady Charlotte Campbell, writer and daughter of the 5th Duke of Argyll, who he is staying with, regarding Mary Robinson, the Maid of Buttermere. Mary is described as 'aloof and unconcerned' on the 9th September 1803, the day before the execution of her bigamist husband, the forger John Hatfield. The letter continues with an account of Lord John Campbell, 3rd son of the Duke and later the 7th Duke of Argyll, who has sent a letter home. Lord John has escaped arrest in France with the help of a governess by dressing in women's clothes and hiding in a wood until the governess manages to get a carriage in which he is carried to safety. This letter is full of incidents that are right up the street of the gothic novelist of which 'Monk' Lewis was a leading exponent. London. For the Booksellers. ND. Circa 1820s. 3 vols. pp. 272; (ii), 182; (ii), 196. 12mo in 6s. Half roan, marbled boards, spine of Vol 3 badly faded. Some minor foxing and some pages trimmed, not affecting the text. Title pages to Vols 2 and 3 appear to be cancels. Printer is J.T. Devison, Aberdeen. A very good copy. London. Longmans. 1963. pp. xiv, 174. 8vo. D/W. London. Faber & Faber. 1967. pp. 206. 10 illustrations. 8vo. D/W. Has Chapters on Wordsworth, Coleridge, Southey, Byron, Shelley & Keats. Cambridge University Press. 2000. pp. xiii, 282, (iii). 17 illustrations. 8vo. D/W. Cambridge Studies in Romanticism 42. Cambridge University Press. 1995. pp. xiii, 249. 8vo. D/W. ISBN 9780521460361. A very good copy. Worcester, MA. Achille J. St. Onge. 1963. pp. 72. Frontis, 1 plate. 8vo. Black cloth, slightly marked. Limited edition of 500 copies. Contributors are Jeffrey Cass, Sarah Davies Cordova, Rodney Farnsworth, Bonnie J. Gunzenhauser, Diane Long Hoeveler, Sonja E. Klocke, Kari Lokke, D.L. Macdonald, Nancy Metzger, Richard A. Nanian, Larry H. Peer, Marjean D. Purinton, Onita Vaz, & Carolyn A. Weber. Aldershot. Ashgate Publishing Ltd. 2006. pp. xiii, 208. 8vo. D/W. The Nineteenth Century General Editors Vincent Newey & Joanne Shattock. London. Mansell Publishing Ltd. 1983. pp. x, 392. 4 family trees, 1 map & 1 plan. 8vo. D/W. Palm Srings. Strand Publishing. 2008. pp. (iii), 52. Illustrated. 8vo. Laminated boards. ISBN 0974197521. A very good copy. New York. Octagon Books, Inc. 1966. pp. viii, 313. 8vo. Green cloth. Reprint, originally published in 1943. Cambridge University Press. 1985. pp. ix, 303. 8vo. Paperback, spine faded. ISBN0521317452. Edge of text bblock with slight foxing, otherwise a bright, clean copy. London. Longman, Hurst, Rees, Orme & Brown. 1822. pp. xvi, 119. 8vo. Disbound. Occasional foxing. 2nd edition. London. Longman, Hurst, Rees, Orme and Brown; John Murray; John Greig. Edinburgh. Constable & Co. 1814. 2 vols. pp. cxxvii, 92; 93 - 209, ci of appendix, (xi) of index. 2 frontis's, 2 engraved titles, 91 plates. Large post 4to. Full red morocco with gilt decoration, all edges gilt, spines sunned, hinges slightly rubbed..Engraved titles and frontis's foxed otherwise clean. A very good copy. Harvard University Press. 1934. pp. xi, 365. 8vo. D/W. Occasional pencil marks in the margins. Includes chapters on Wordsworth, Keats & Browning. Cambridge University Press. 2005. pp. x, 221, (v). 8vo. D/W, unevenly faded on front cover. Cambridge Studies in Romanticism. ISBN 0521846757. A good copy. Basingstoke. MacMillan Press Ltd. 1999. pp. xi, 264. 8 illustrations. 8vo. D/W. Romanticism in Perspective: Texts, Cultures, Histories. General Editors Marilyn Gaull & Stephen Prickett. ISBN 9780333725214. A very good copy. BOUND with PASQUIN, Anthony.POSTSCRIPT TO THE NEW BATH GUIDE. A POEM. Dublin. J. Stockdale for James Moore. 1793. pp. xvi, 256. 8vo. Half calf, spine relaid, marbled boards. Modern marble slipcase. Title page very grubby, most of text block browned. 1st Dublin edition. At foot of p. 256 it says 'End of First volume'. All published. ESTC T7170. BOUND with PASQUIN, Anthony. POSTSCRIPT TO THE NEW BATH GUIDE. A POEM. Dublin. Richard White. 1790. pp. 96. 8vo.Title and last leaf very grubby. The PO of Postscript excised on title page. ESTC T76271. Grasmere. The Wordsworth Trust. 1994. pp. 69. 19 colour plates, further monochrome illustrations. Large post 4to. Paperback. Exhibition catalogue. A good, clean copy. Much Wenlock. RJL Smith & Associates. 1994. pp. 20. Illustrated. 8vo. Printed wrapper stapled as issued.